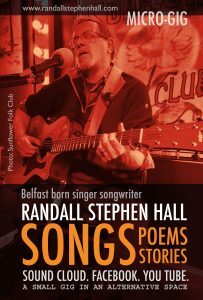 World Poetry Celebrates Randall Stephen Hall From Ireland! 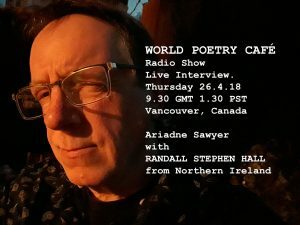 Ariadne’s Notes: On April 26, 1:30 PM, PST The World Poetry Café welcomed the talented poet, musicians and author Randall Stephen Hall to the show for an exciting interview on CFRO, 105. 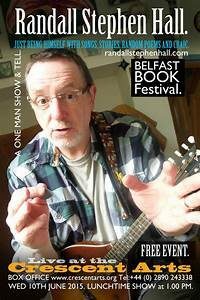 FM with his music, poems and insights on the situation in Ireland. Also featured was Ken McAteer, outgoing president of VAHMS with a preview of ExporASIAN Heritage Month, 2018 with over 50 events and partners during May including a first ever partnership with First Nations and Indian Cultures www.explorasian.org. Featured e-poets were: Kwabena ‘Nyameba’ Bediako from Ghana and Passang Sherpa from Bhutan. TO HEAR THE SHOW CLICK HERE! hiatus of some years . . . So from then until now I’ve been writing songs and poems, creating art and eventually getting involved in a small business with Natasha, my eldest daughter which sells some of my little illustrated books, T-Shirts, Tea-Towels, cards and music, on the web and, up until recently at St. George’s Market in Belfast. As you can see I am stimulated by our local heritage, sounds, languages and see the potential connections between them. My great great grandfather, Richard Hall, was born in Westmeath, almost the middle of Ireland. He joined a British/Irish regiment in 1848 at the height of the Irish Famine. In the following 22 years he travelled to South Africa, India, during the Indian Mutiny and eventually spent about ten years in Manitoba, Canada, where his first 6 children were born, one being my great grandfather. Over the years I developed an interest in native Culture in Canada. 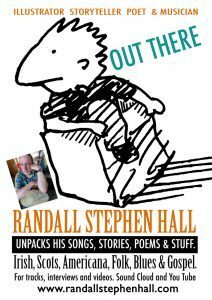 You Tube/ Randall Stephen Hall two different channels. He also presents shows in schools, community centers and other venues. This entry was posted in Ariadne's Notes, E-Poets, Featured Poets, General and tagged Author Sharon Rowe, International Peace Award Ariadne Sawyer, Kwabena 'Nyameba' Bediako, Passang Sherpa, Randall Stephen Hall, Victor Schwartzman on April 28, 2018 by Ariadne.